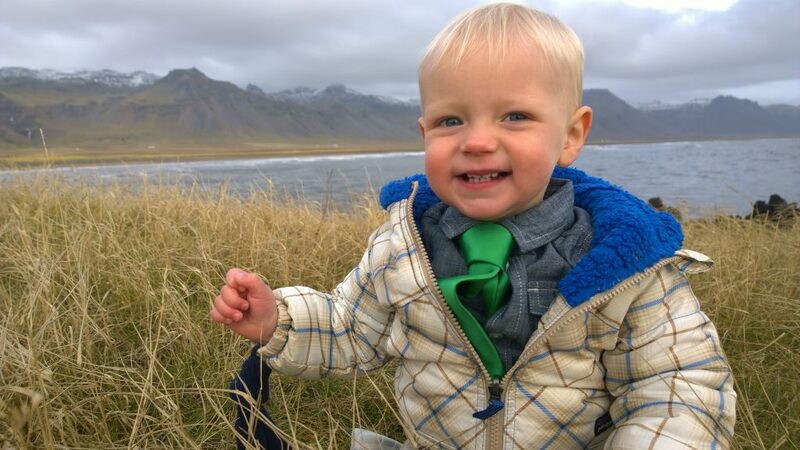 In October of 2015 Amy, Alistair, and I traveled to Iceland for Ofer and Emily’s wedding. Great venue guys! I don’t know if we ever would have made the voyage from Colorado. We had such an amazing time and already want to go back. It’s such a relaxing place to rent a car and drive around. 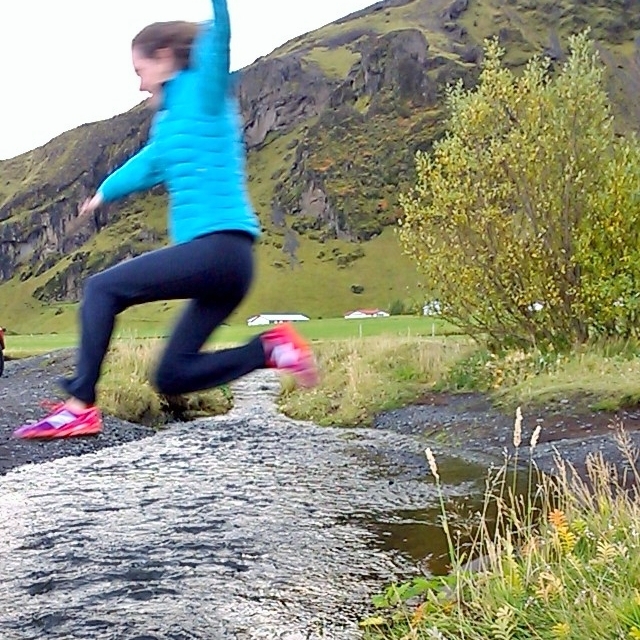 Iceland is about the size of Pennsylvania but only has 330,000 people which made for sparse information on trail running. I Googled around but found next to nothing on actual routes, let alone in English. 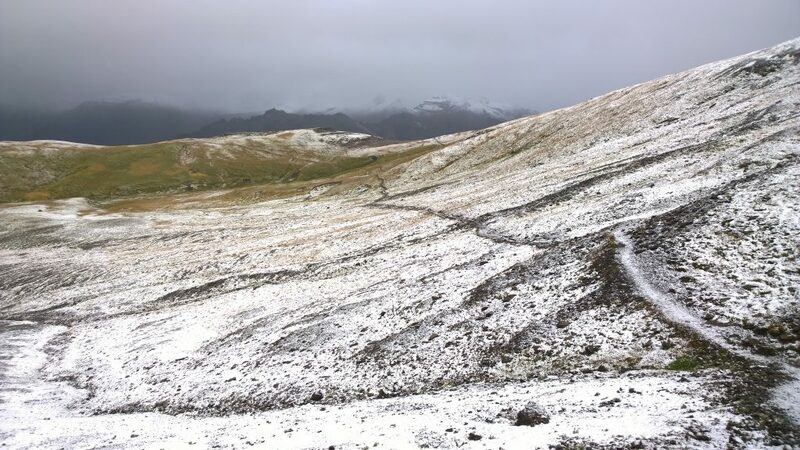 However, our guidebook listed an “amazing 6-8 hour hike” in the Skaftafell which is a section of the huge Vatnajökull National Park. How long would that take to run? Was it even runable? Would I get lost on the ice cap? 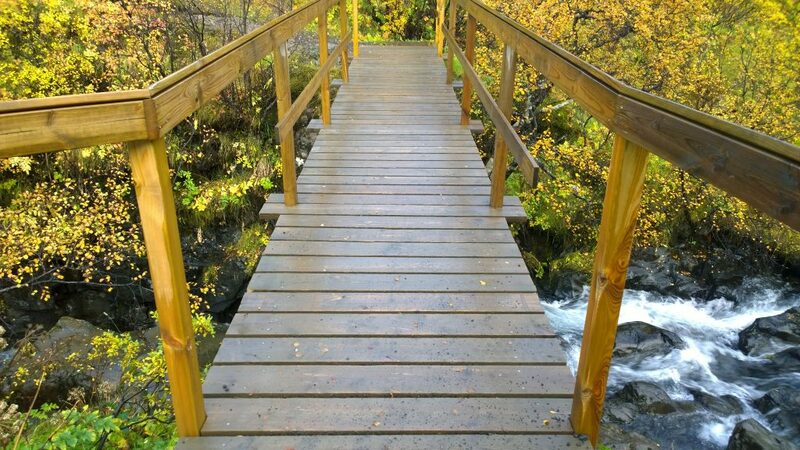 Would I be captured by Iceland’s famous elves en route? The best way to answer all of these intriguing questions was to muddy up my shoes. I started at the Skaftafell Visitor Center, took a phone picture of the trail map for reference like I normally do when traveling (pro tip! ), and set out for an adventure. The above screenshot shows how the run turned out. I ran it counterclockwise. 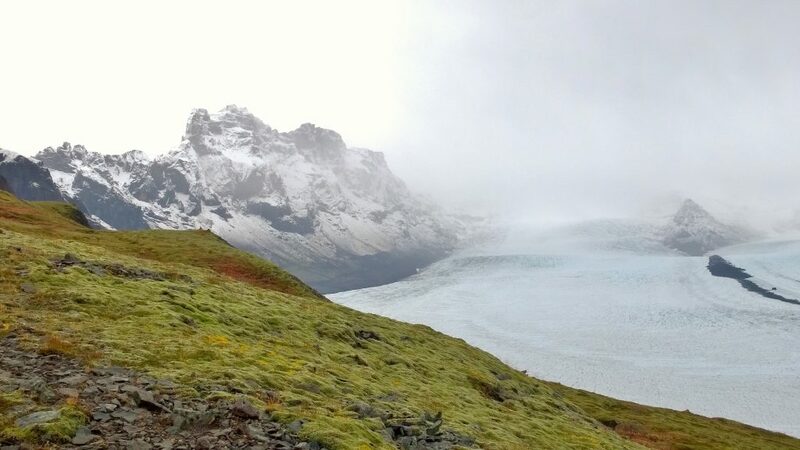 So I went past the big glacier to the east in the first half, traversed across the top below a mountain peak, and descended above a glacial river the second half. You can see it on Strava here. It was absolutely stunning! Was it the best trail run I’ve ever been on? Hmm, it may just be. It’s a tough battle between this one and running outside of Cortina d’Ampezzo in the Dolomites of Italy. It was definitely the best in terms of big sky landscape, it’s hard to describe seeing huge glaciers and ice caps for the first time, let alone while running a trail. I felt like a drooling toddler gulping in the amazing world for the first time. The shot above shows the huge scale of the area. 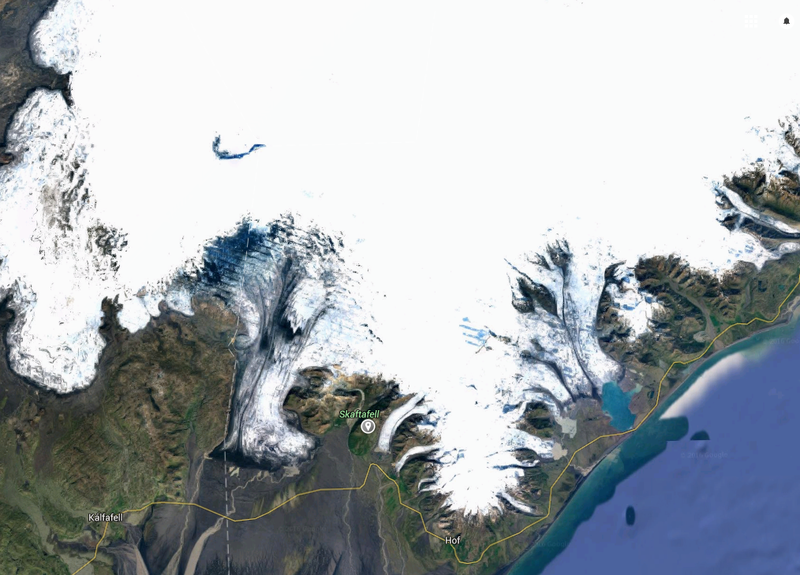 The big glacier that you see in a bunch of my pictures is that little river looking thing to the right of the word “Skaftafell” towards the bottom center of the map. By the way, you have to pronounce glacier the way British people do. It’s far superior, look it up and learn it. 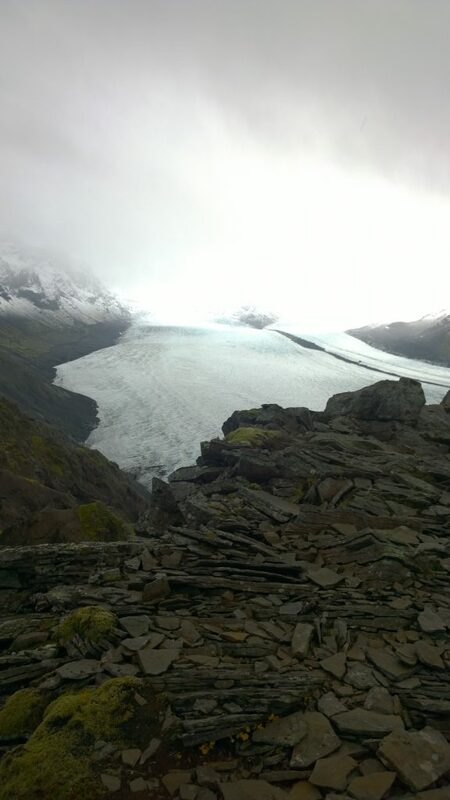 According to the picture, you may think the glacier is small but it’s enormous when you’re there. Kind of like that time I saw Yeti or the time your uncle Franko order the 18″ steak and cheese with “The Works” because it “only looked to be 3″ on the picture menu”. 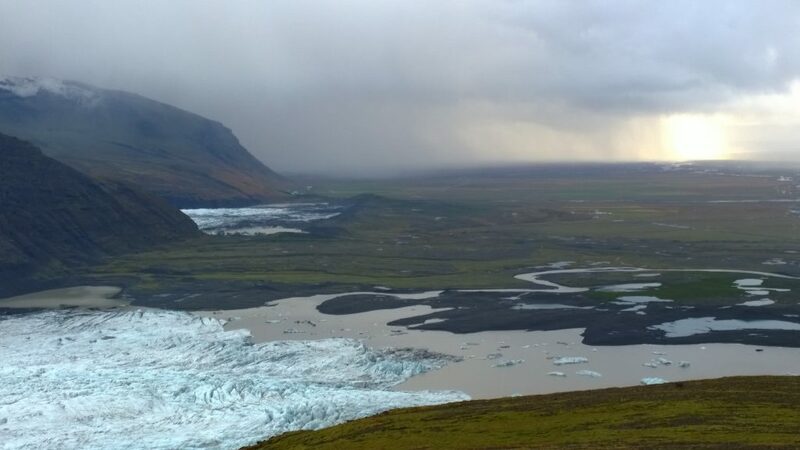 Anyhow, that glacier flows off the Vatnajokull which is the largest ice cap in Iceland. 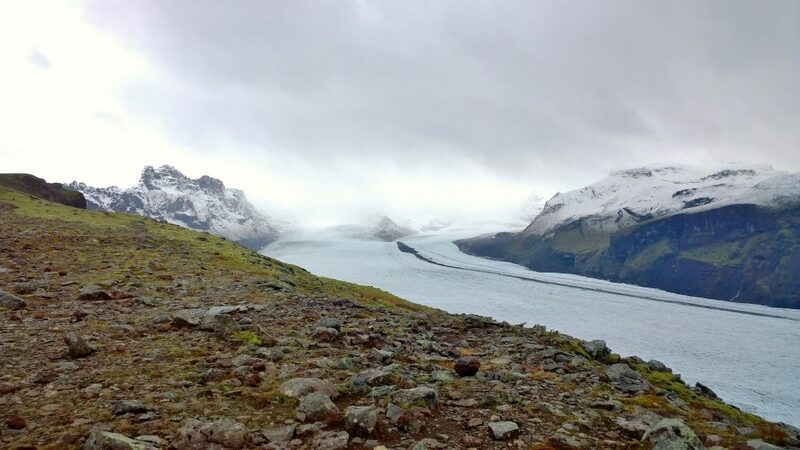 An ice cap is a huge covering of ice (these are things that one must learn while in a place called Iceland). 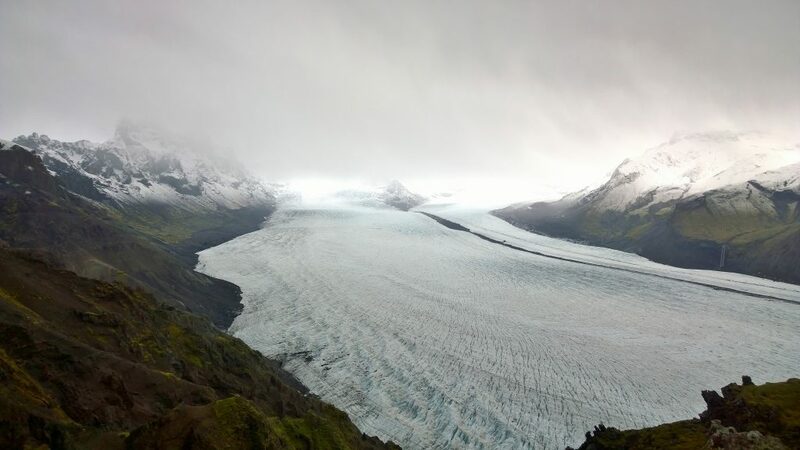 A glacier is essentially a river of ice from the ice cap that flows downhill, carrying it away from the ice cap. Like a stream flowing out of a lake, just frozen. 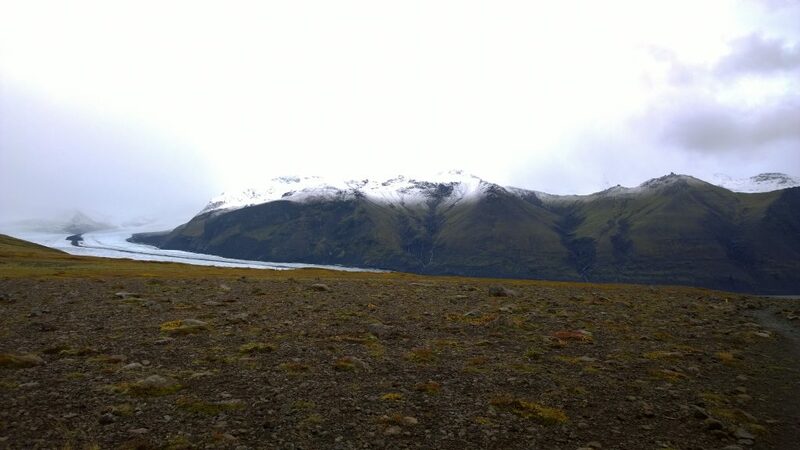 Further east on the map, you can see the Jokularlon Lagoon which is a rare spot where the glacier meets the sea. We went there and it’s one of those must-see tourist traps so check it out if you’re in the hood. As a side note, the lagoon had a lasting impact on Amy and I by visibly demonstrating the effects of climate change. Old photos of the lagoon show how the lagoon recently actually reached the sea and how quickly it’s receding year by year as our climate warms. Now there’s a huge lagoon where it used to extend that separates it from the sea. Yikes. Ok, on to the run. 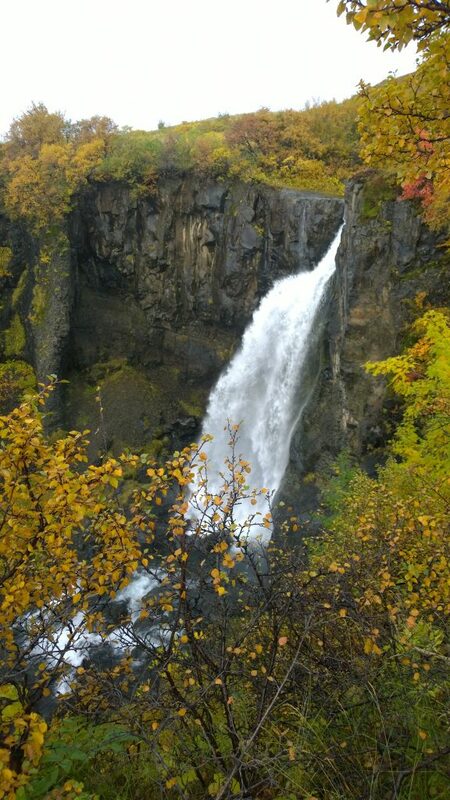 It started by going up to a popular waterfall that on it’s own was incredible. I saw a few people in that first mile and then I was totally on my own. 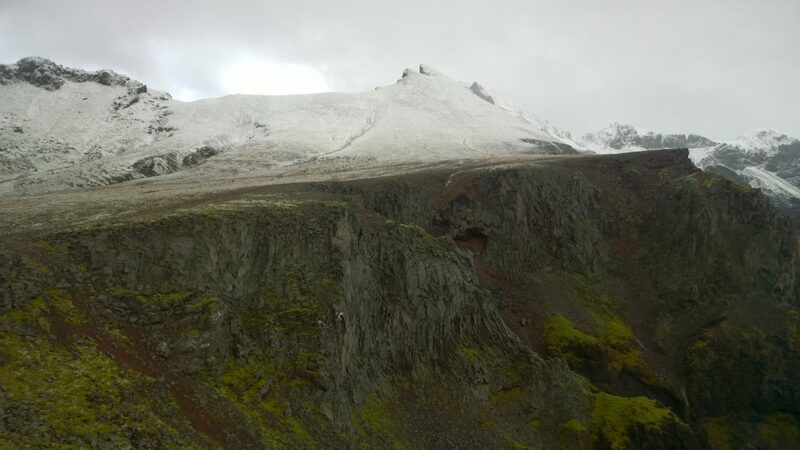 I ascended a good bit to reach sheer cliffs hundreds of feet above that monstrous glacier that comes off the Vatnajokull. 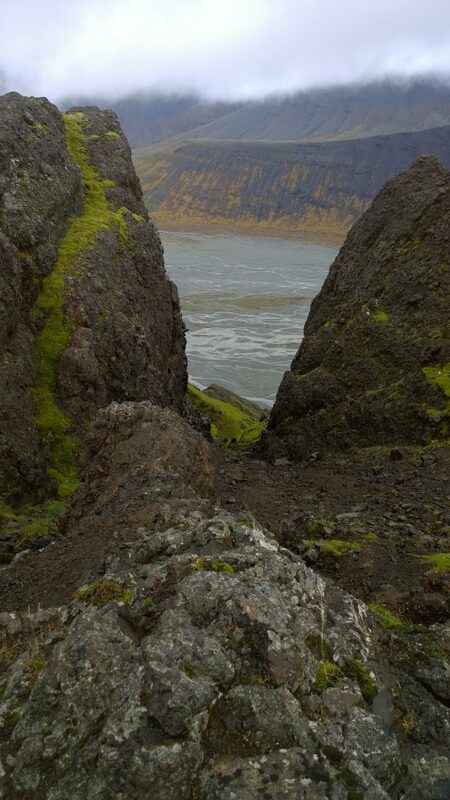 The tops of the cliffs had spectacular views, you’ll see it in the pictures below. 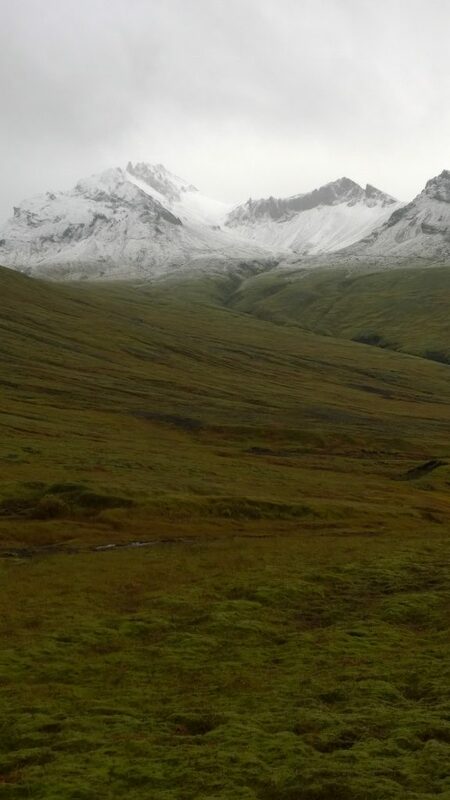 It was a bit rainy at first and I was climbing quickly so then it started snowing. 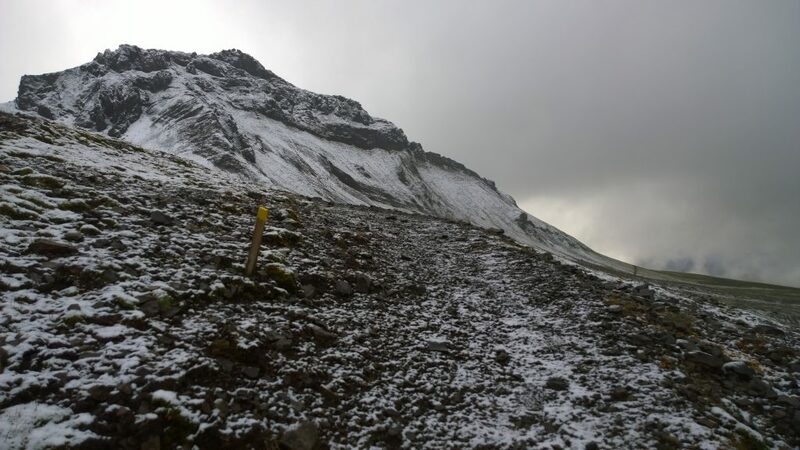 With the altitude rising, the vegetation also changed quickly to almost nothing and it became difficult to follow the now rocky path at times especially with the snow blowing into my face. It felt incredibly desolate up there and I really felt like I had to stay on top of things and be careful not to twist an ankle or get caught out if the snow picked up. I briefly thought about turning back in case this turned into a blizzard but it looked just clear enough where the weather was coming from that I stuck with it. 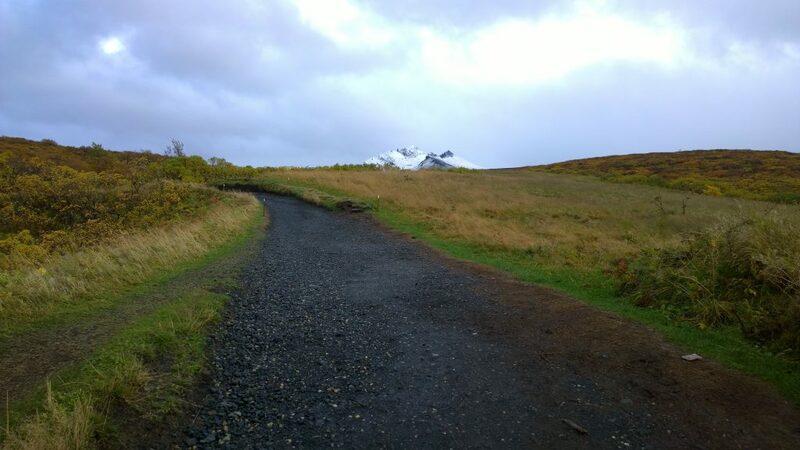 I got to my high point and took a left onto a rolling winding path that traversed beneath a snowy peak and across the pseudo plateau that my route would cross. 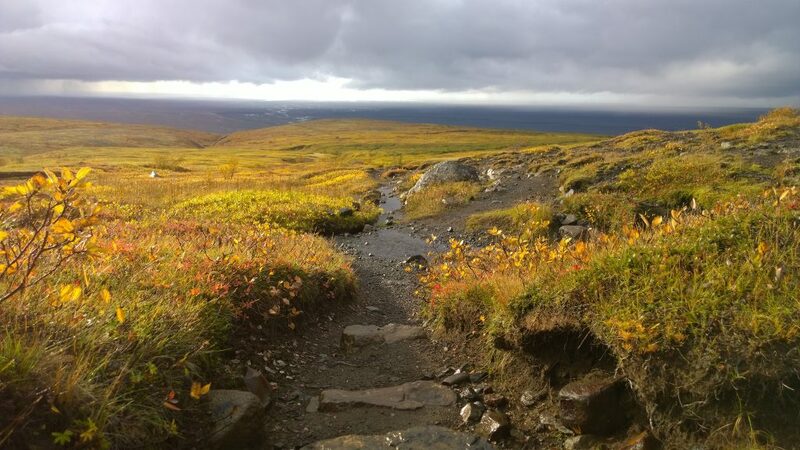 That trail brought me across to cliffs above a glacial river on the other side of the plateau and taking a left I started descending through the returning plant life. I bombed the downhill through beautiful green fields with the sea out in front and below me in the distance. This was my favorite section of the trail. The sun peeked out and it was so green and lush with water in so many different forms all around me all at once: glaciers, glacial rivers, dew, streams, ice caps, the sea. Down and down I ran, finally bringing me back to the more civilized trails where there were a few day hikers. I hadn’t seen anyone in about 7 miles by that point. Then I connected to the trail I had started on and ran back to the visitors center along with all of the mud I had amassed over the previous 10+ miles and 2,700ft of climbing. Below is a pictorial of the trail run. If you’re reading this and actually do this run then please please please write in the Facebook comments at the bottom and let me know how it turned out! The footing was very good early on. The trail goes to that peak in the distance. 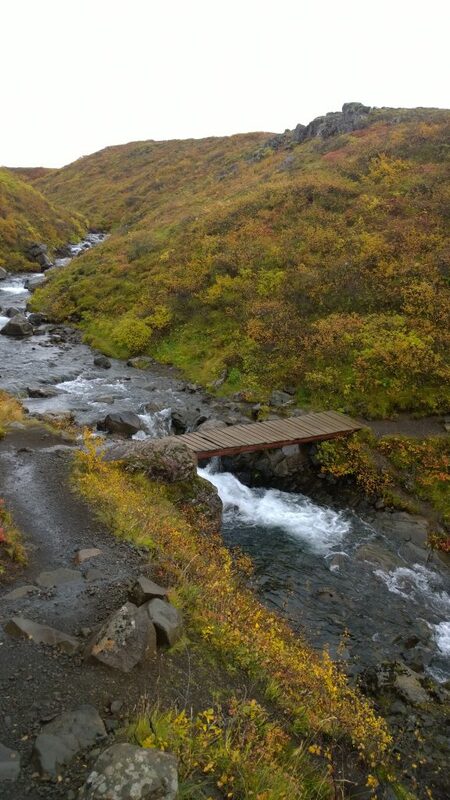 Loads of stream crossings. Love it. 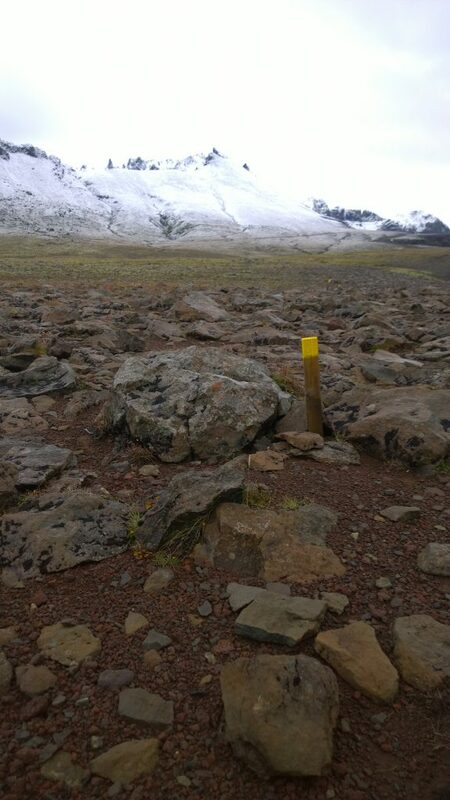 After climbing a good ways, you’re now above the glacier. 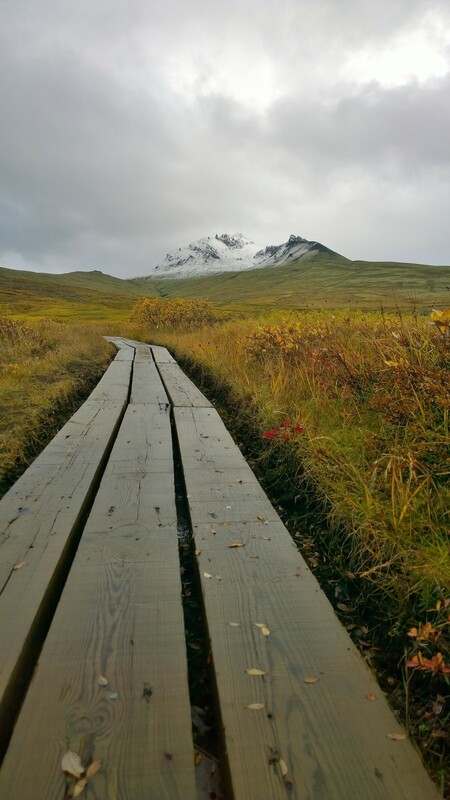 October was a stunning time to be there with the frosted mountain tops. 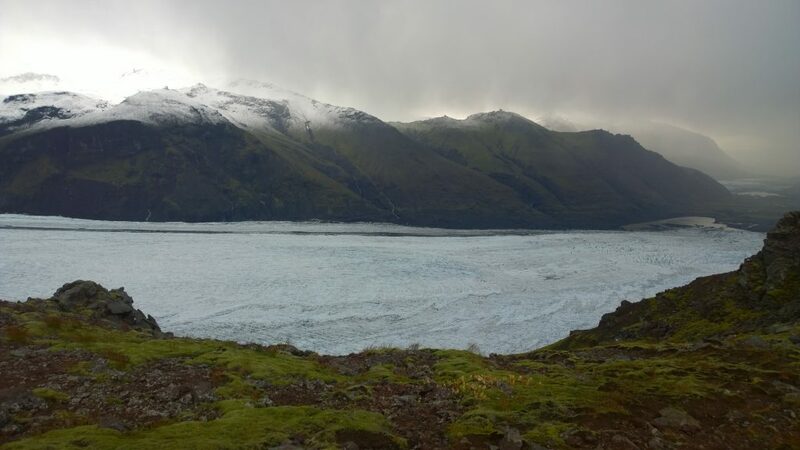 The glacier hits it’s melting point where it becomes a river that shortly reaches the sea. Gittin’ rocky with it. These little markers got tough to see when the snow started coming down. I had to use my Colorado snow skillz to sleuth them out. The scale was blowing my mind. 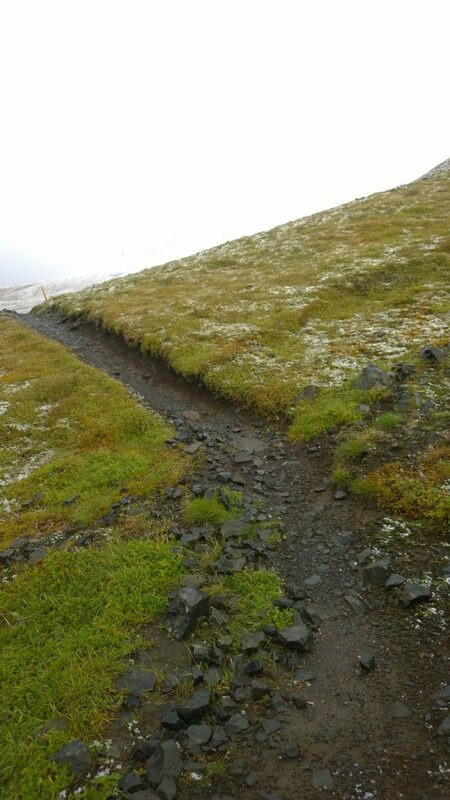 It got tough to follow the trail at points, I was worried that if the snow picked up then I’d get lost. Where does the trail go? Incredible! The traverse in the middle of the run. On the descent back. Now the snow looks so far away. OMG this run just got even better! So lush during the 10 seconds of sun I got on this run. Sunrise Patrol © 2019. All Rights Reserved.